It is recognised that one the easiest ways to get more out of an engine is to bring it up to the original design specification. Commonly called blueprinting, it is still beneficial today with modern engines produced on CNC machines. With an older engine it is even more effective. One simple operation on a Commando is to time the camshaft to give the correct valve lift at top dead centre. To adjust the camshaft timing you will need a dial gauge and a timing disk. Don't attempt it without the proper tools. Ideally you will replace the camshaft sprocket with a vernier adjustable one. This allows very fine adjustment of the timing by simply turning the camshaft to the correct position and inserting a locking peg into aligning holes in the sprocket and boss. The camshaft timing can be advanced or retarded in 5 degree steps by remeshing the pinions and sprockets (one tooth on the camshaft sprocket equates to 40 crankshaft degrees and one tooth on the intermediate gear equates to 15 crankshaft degrees). For example, to make advance the camshaft timing 3 degrees, turn the camshaft sprocket in the chain 1 tooth clockwise and then rotate the intermediate gear 3 teeth anti-clockwise to advance the timing by 5 degrees. Then reduce this to 3 degrees by filing a step on the camshaft key; this will be a small step and remember that 1 degree on the camshaft is 2 degrees on the crankshaft. Always advance the camshaft beyond the desired position and then retard it by filing a step on the load side of the key so that it is pulled into location by the running engine. 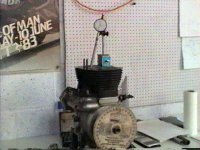 On a long stroke engine, the up and down displacement of the piston is very small near the top of the stroke. Therefore TDC should be found by taking the mid point between two positions before and after TDC where the distance of the piston below the top of the barrel is the same. 15 degrees before and after TDC should suffice. Measure the distance with a dial gauge firmly attached to the top face of the barrel. After setting the timing disk and pointer to TDC, check it again. Camshaft lift is measured at the top of the inlet pushrod. With the pushrod in place, fix the dial gauge firmly to the top of the barrel and inline with the pushrod's movement (if the inlet pushrod is too long, use one of the exhausts). Turn the engine forwards and zero the dial gauge at the centre of the base circle, i.e. where the opposing pushrod is at maximum lift (this is only approximate and can easily be seen by locating the opposing pushrod and visually finding the maximum lift). Turn the engine forward again until TDC, resisting the movement of the camshaft with your hand to keep the camchain tight. With a vernier sprocket, turn the camshaft to give the required lift at TDC and insert the locating peg. If you find that adjacent peg holes straddle the desired camshaft position, the intermediate gear pinion can be remeshed against the crankshaft by one or two teeth to offset the vernier. Back the engine up 20 degrees or so and turn forwards to TDC with the cam chain held tight to confirm the setting. If you don't have a vernier sprocket, turn the engine forward until the camshaft gives the required lift and then read off the crankshaft position from the timing disk. Adjust the timing to correct this difference as outlined above. The lift on both inlet pushrods should be measured and any difference averaged out. Finally, check that the timing disk and pointer have not moved by finding TDC again. Combat (SS) 06-3536 59 BTDC 89 ABDC 88 BBDC 60 ATDC 0.157"
3S 06-3761 59 BTDC 89 ABDC 88 BBDC 60 ATDC 0.166"
4S 06-4858 65 BTDC 83 ABDC 88 BBDC 60 ATDC 0.1885"
*Lift is measured from the base circle on the inlet pushrod at TDC. Clearances measured when opposing valve is at full lift with engine cold.